The first thing I noticed about Melbourne was the unexpected juxtaposition of new and old architectural styles – Victorian, Art Deco, neoclassical, contemporary — you name it! I was still in the Uber, driving from the airport to Melbourne's CBD (Central Business District), having just visited my daughter on her semester abroad in Sydney. Based on what I was seeing outside the window, I was already getting the sense that Melbourne would be an exciting city to explore. As Australia's second most populated city after Sydney, Melbourne is frequently at the top of the 'World's Most Livable Cities' lists, receiving high scores for its healthcare, education and infrastructure. But it's also a popular city for visitors with lively cafés, pedestrian-friendly streets and dynamic arts and cultural events. The food, wine and cocktail scene, born from a melting pot of cultures, mirrors the diverse architecture of the city — so many unique and enticing places to eat and drink! Darling Cafe - 2 Darling Street, South Yarra. This busy little café is a great spot with good food and coffee to get your day going. 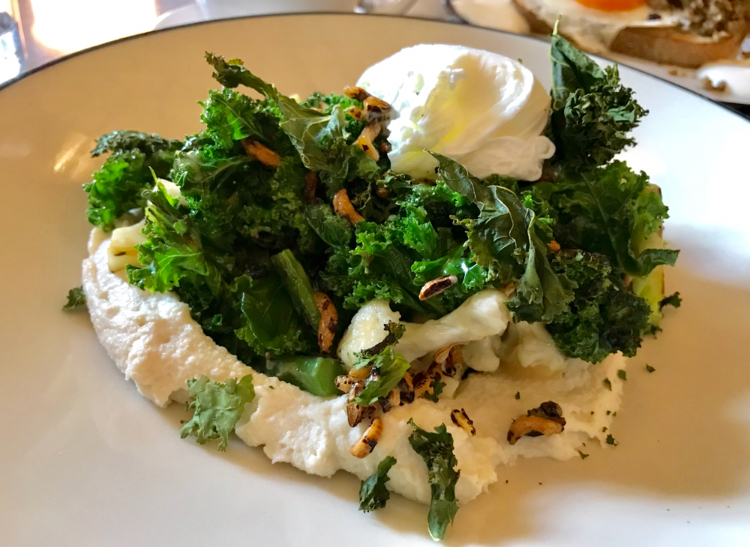 This photo From Brunch at Darling Café is the definition of a picture that's worth a thousand words! The Hardware Societe - 120 Hardware Street. A popular breakfast and brunch spot with a casual, rustic-chic atmosphere. Higher Ground - 650 Little Bourke Street. Open for breakfast, lunch and dinner this airy, bustling spot serves excellent (strong!) coffee as well as hand-crafted cocktails and wines from all over the world. Two lunchtime favorites: kale and cauliflower salad with almond hummus and avocado and the minced lamb fry up with miso eggplant and fried eggs. The coffee is so strong they serve a glass of seltzer with it! One of the many interesting cocktails at Galah. Galah - 216 High Street, Windsor. My daughter discovered this fun speakeasy-type bar that she "loooooooved"! It has a great selection of cocktails, Australian beer and wine which, according to their website have "minimal intervention and maximum integrity.". Eau de Vie - 1 Malthouse Lane. This cocktail bar is hard to find! It's at the bottom of a tiny street, more like an alleyway, and has a brown, unmarked doorway. Once inside, you will find a happening scene and delicious cocktails. Try the whisky tasting served with several delicious cheeses. 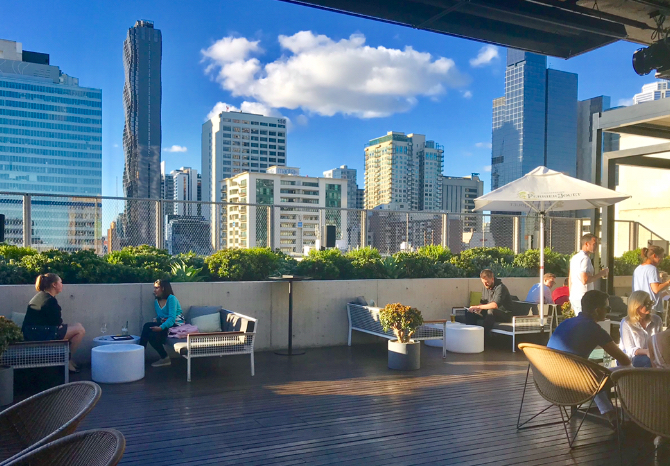 The Rooftop at the QT Melbourne Hotel - 133 Russell Street. If it's a beautiful, sunny evening, this is the place to be! A big, open-air patio with nice views and comfortable couches to settle into. The gin martinis, made with Australian Four Pillars gin, were so good that my friend and I couldn't help but have two each! Jungle Boy - 96 Chapel Street. A small, tiki-style bar with a hidden entrance in the back of a Boston Subs sandwich shop. This hard-to-find bar has a cool vibe, kitsch decor and tropical cocktails. Embla - 122 Russell Street. A cozy, little wine bar with excellent food and an interesting selection of wines and spirits. Closes early on Sunday nights. MoVida - 1 Hosier Lane. Delicious Spanish tapas in a fun atmosphere with friendly service. This spot is on a little alleyway with buildings that are completely painted with very cool-looking graffiti. I spent an evening at the bar sampling many delicious small plates paired with excellent dry sherries. Every dish was bursting with fresh flavor and beautiful to look at too! My daughter went to MoVida with friends and said, "this dish was the best thing ever - omg. 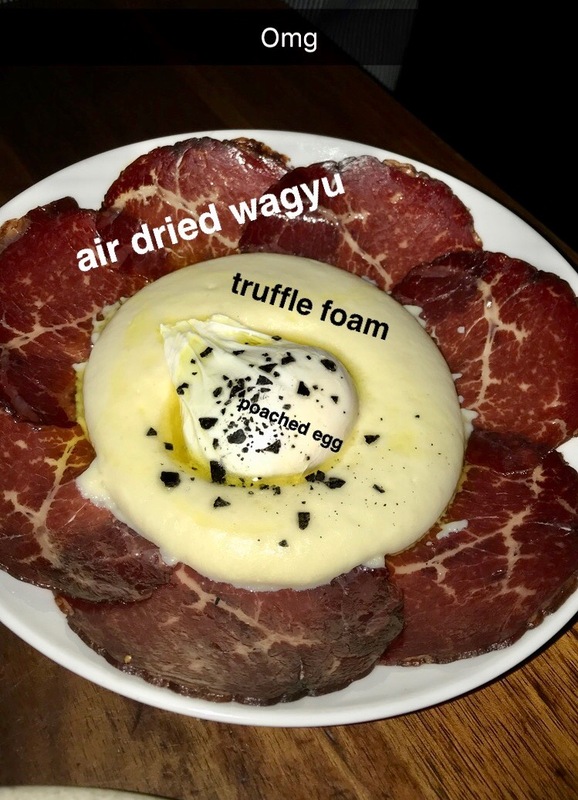 The truffle foam was like realllly soft, light truffle mashed potatoes." The desserts at MoVida are creative and delicious! Mr Miyagi - 99 Chapel Street, Windsor. This trendy Japanese restaurant is a neighborhood gem. But be forewarned that there is usually a very long wait for a table! From my daughter: "omg! this was SO GOOD from Mr Miyagi. It was just fried broccoli, literally covered in cheese and it was soooooooo good." Kingfish Crudo at Mr Miyagi. Dinner By Heston Blumenthal - 8 Whiteman Street in the Crown Towers. Heston Blumenthal is a British celebrity chef famous for molecular cuisine. Dining at this elegant, special-occasion restaurant is quite an experience. The food is creatively presented and there are many taste sensations. The wine list is full of interesting selections from all over the world. My friend and I had an amazing Kusuda Syrah made by a Japanese winemaker in New Zealand! This Birds egg dessert had a white chocolate crust and was filled with coconut parfait. The desserts at Dinner By Heston are creatively presented and as equally delicious! Another reason to visit Melbourne is to explore the natural beauty surrounding it. The nearby Great Ocean Road is one of the world's most famous and scenic coastal drives. There are also two breathtaking wine regions only an hour's drive away — The Yarra Valley to the north and the Mornington Peninsula to the south. I didn't make it to the Yarra Valley but I loved my day on the Mornington Peninsula, surrounded by rolling green hills, winding country lanes and the scent of salty sea air. An excellent lunch spot in the Mornington Peninsula is Rare Hare at Willow Creek winery. The fruit and vegetables could not be any fresher. The dining room — inside and outside — has communal tables overlooking the vineyards. Port Philip Estate (and they have beautiful rooms if you want to stay overnight). Click here to read my post about Moorooduc Estates, a Mornington Peninsula winery making excellent Pinot Noir and Chardonnay as well as Pinot Gris, Pinot Gris on skins and Syrah. Their 'cellar door' is open daily for visits. Salads, Pizza, fish,Meats, desserts at rare Hare are all delcious and fresh! The dining room at Port Philip winery. There are also beautiful rooms here to stay overnight. The Dining room at Paringa Winery where You can sample their award-winning wines. 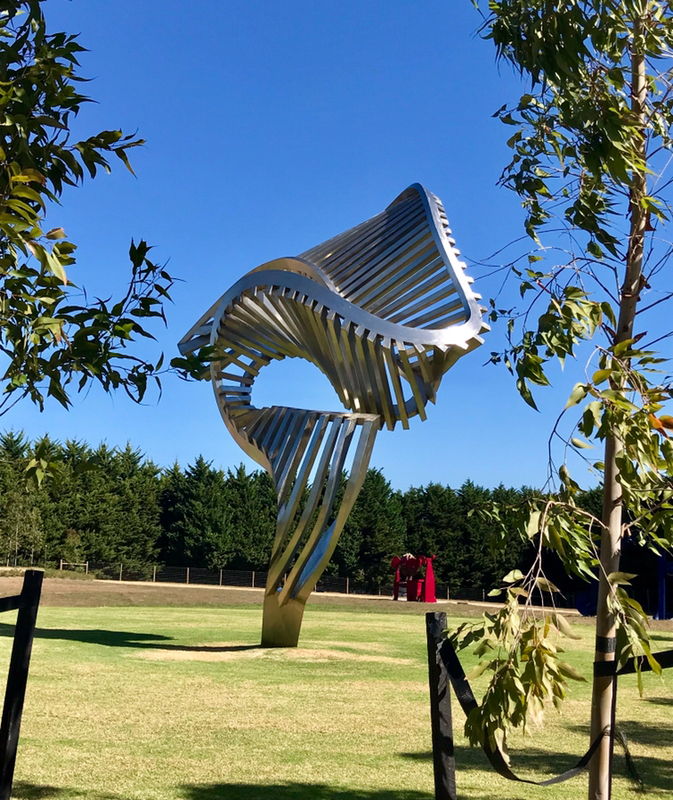 Don't miss the exquisite collection of sculptures at Point Leo Estate on the Mornington Peninsula, overlooking the vineyards and the sea ... amazing!